This was the first of a two-nighter at London’s Royal Festival Hall, part of a UK tour extending on into February before heading off to Europe, the USA and eventually Japan. The tour is in support of the new album “Dream Attic”. Thompson takes the stage as part of a five piece band; his sonic blue Strat is accompanied by Michael Jerome on drums and Teras Prodaniuk on bass; texture and contrast are supplied by Joel Zifkin on violin and mandolin and the multi-talented Pete Zorn on sax, guitar, mandolin and flute. Full credit to the team at the RFH, the band sounded fantastic (believe me, that’s not always the case with electric music at this classical venue) and there was a cool light show running too. Where he gets his energy from is anyone’s guess, but this is an inspiring group of musicians and given the packed house and the obvious fondness of the audience he doesn’t hold back. We are treated to two full sets - the first of tracks from the new album, the second a kind of “greatest hits” which included a brief acoustic interlude. Thompson’s recording career dates back to the late 60s with folk rock band Fairport Convention. Since 1983 he has effectively been a solo artist recording a wide range of albums with various selected backing bands, while also participating in other projects with other musicians. Over the years he has soaked up many influences and journeyed far from his folk roots; much of his excellent and inspired guitar soloing - including some climactic extended solos - owes its flavour to American country guitar. “Tear Stained Letter” is cajun-inspired, while tracks on the current album such as “Bad again” mix country with Chicago boogie. 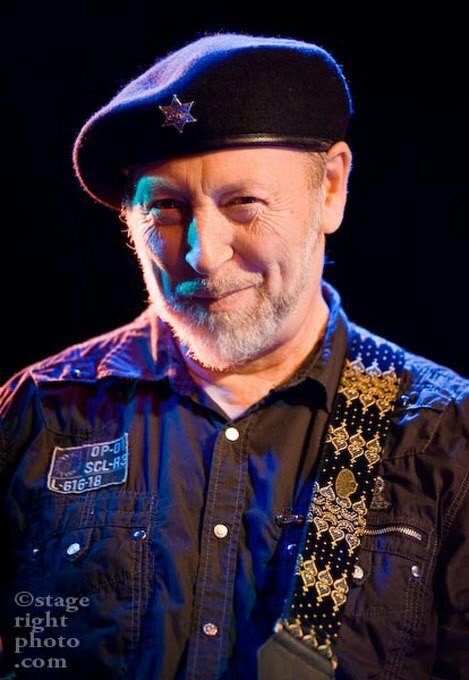 His influences range wide but somehow it all comes out as Richard Thompson’s music. However much Americana may be on the surface there’s something British about his song writing that sets him apart. One part of this is his traditional British folk influence - there’s a freedom in the cadence and rhythm of his lyric writing that is purely British. Another part of the equation is the quality of the songs - some have great hooks, some have singalong choruses; others are quiet, deeply felt and moving or inspiring. His ability to keep moving forward in his career is key to his success - aspiring singer/songwriters take note if you too want a long career. I confess to being a Richard Thompson newbie. After last night, I understand what all the fuss is about. CD Review: Led Bib "Bring Your Own"
Peter Erskine Drum Masterclass 22 Feb. WHERE?! Is (Long-Form) Jazz (Journalism) Dead?